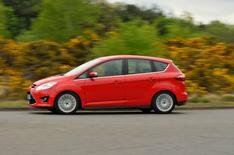 2013 Ford C-Max 1.0 Ecoboost 100 review | What Car? Ford has put its new small engine, the 1.0-litre turbocharged petrol, into its mid-size MPV to create the C-Max 1.0 Ecoboost. 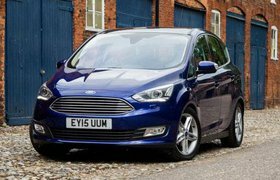 Its available with either 99 or 123bhp, and in the five-seat C-Max or seven-seat Grand C-Max. This three-cylinder engine is gradually replacing the non-turbo four-cylinder 1.6-litre units in Ford's range, having already been introduced in the Fiesta, Focus and B-Max, where it's won praise for its refinement and performance, if not its real-world economy. Here were testing the lower-powered, five-seat model, so can such a small engine work in a car thats designed to ferry your family around? What's the 2013 Ford C-Max 1.0 Ecoboost 100 like to drive? The C-Max feels just like a small family car from behind the wheel, so if youre upgrading from a Focus, you'll feel right at home. It has the same precise steering, agile and secure handling and a beautifully controlled ride. Yes, it's a little firm on rough surfaces, but any bumps are quickly dealt with, so youre unlikely to have any complaints from travel-sick kids in the back. The engine is equally impressive. It's quiet, smooth and feels far stronger than you'd imagine a 1.0-litre could. Acceleration isnt quick, but this C-Max is perfectly able to keep up with traffic out of town and there's enough mid-range shove to save you having to change gear too often. 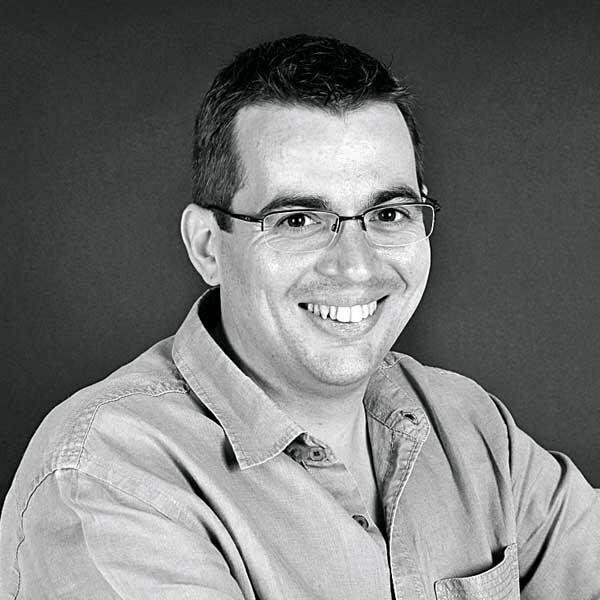 There are no noticeable flat-spots in the power delivery, either, so it's easy to make smooth progress. It's only on the motorway or when overtaking that you may want more performance, but even then it'll be rare. What's the 2013 Ford C-Max 1.0 Ecoboost 100 like inside? The impression that the C-Max is essentially a taller small family car carries on to the cabin, which isn't all good news. Yes, there's lots of space up front, and the people in the two outer rear seats have plenty of stretching room. Whoever is in the middle won't be quite so happy, though. The middle seat is narrower than the outer ones, so unless the person is particularly thin hipped, they won't want to be there for long. At least the boot is big, so everyone's luggage will fit, and there are lots of storage cubbies dotted around the cabin. It's just a shame that there aren't more of the practical touches MPV buyers expect. Folding the rear seatbacks leaves a big step in the load area, and there's no split-level boot floor to even it up. If you want maximum space, you'll also have to remove the heavy seats; they dont fold into the floor. The quality and layout of the interior leaves a bit to be desired, too. The stereo buttons could be easier to use, especially in entry-level Zetec versions that come with a plain grey and silver dashboard. Higher-spec models have a classy-looking gloss black Sony stereo, but the controls are still too fiddly. Equipment levels are decent enough. Zetec cars get the basics, such as a digital radio, air-con, USB connection and a heated windscreen, but you may want to spend the extra 1500 on a Titanium for its smarter dashboard, dual-zone climate control, automatic lights and wipers, cruise control and keyless starting. If you're after an MPV that'll easily take five people and their luggage, the C-Max isn't the best bet. A Citroen C4 Picasso is a better bet, or something slightly larger, such as a Peugeot 5008 or Toyota Verso. If you simply want a more practical car than a small family hatch, that has the benefit of a raised driving position and easier access, the C-Max is worth considering, especially if you want to enjoy driving your car. However, while this Ecoboost engine is perfectly up to the job of powering the C-Max, we've been disappointed by its economy in other cars. We're averaging just 36mpg in our Ford Focus Ecoboost 125, so you should reckon on getting about the same in a C-Max, or less if you regularly carry a full load of passengers. For that reason, if you do enough miles to justify the extra expense, our favourite model remains the 1.6-litre diesel.